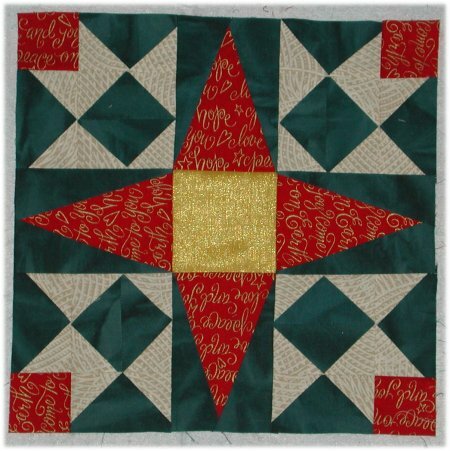 At the time I was one of the beta-testers for Marcia Hohn's Quilter's Cache block patterns; one of the latest ones she sent for me to work on is called "New Hampshire Star". I liked the result so well that I decided to make 3 more so I could have a table runner. One of my personal "rules" is that I need to use only stash fabric for the blocks that I test for Marcia .. to sorta justfiy my stash, ya know? Well, that rule almost got me in a bind with this project. I was using Christmas colors for this block (actually, I'm using Christmas colors, more or less, for all the blocks so that *at some point* I can put all the blocks together into a vast sampler quilt and the colors will hopefully tie everything together!) and because I have used these fabrics in other blocks, the quantity is very limited .. with absolutely NO chance to getting more. The green was completely used up for the blocks and the 1/2" border. There was *no* more available for the border I wanted to make, as per Marcia's instructions. I had a very limited amount of the cream and the gold quilter's lamé. After thinking about my options for border treatment (and auditioning Marcia's border in other fabrics), I decided my best use of the fabric that was left was to make individual prairie points. I aligned the points with the flying geese in the blocks. This worked out rather nicely until I got to the corner .. which broke the pattern. ARRRGGGHHHH! After further contemplation, I decided to "fill" up the space at the corners of the border with circles of the gold lamé. Quilter's Cache website is THE premiere site for free quilt patterns. Marcia is an incredibly talented and imaginative person with an evil sense of humor. :-) Check out her website and help support her by patronizing her advertisers, as well as shopping in her store.